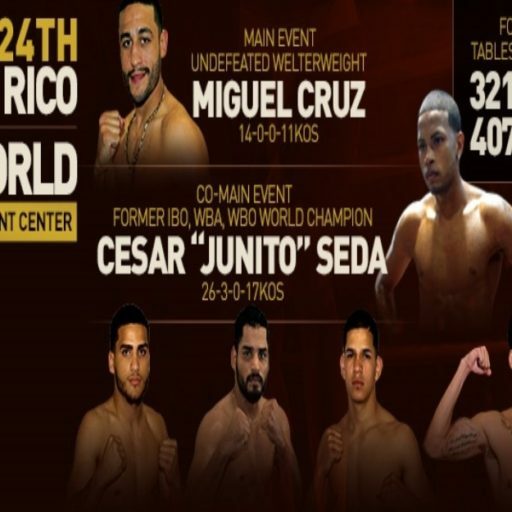 10 exciting fights are scheduled, the doors open at 6:00 PM until 11:00 AM P.M.
Miguel Cruz 14-0-0 (11 KO’s) undefeated Puerto Rican welterweight, will be facing Ali Mammadov 11-3-0 in the main event of the evening in a scheduled 8-round bout. In the co fight main, the prospect from Orlando, Dennis Galarza, will be fighting in front of his audience in a scheduled 6 round match. In addition, ‘Puerto Rico vs. The World’ will present the return of former world title challenger Cesar “Junito” Seda who returns to the ring after a short period of inactivity. 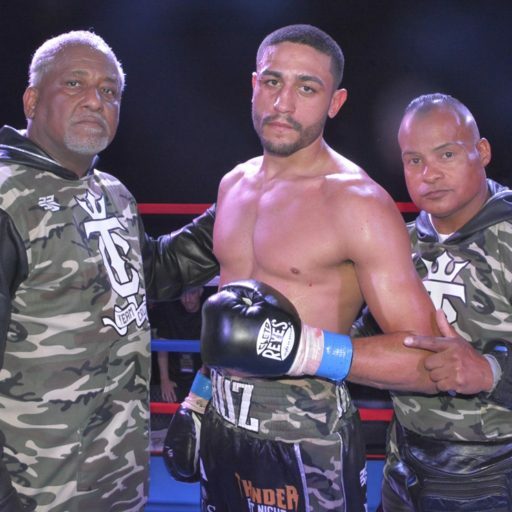 Felix ‘Tito’ Trinidad, the Boricua boxing legend, sent Seda a message expressing his support, and invites boxing fans in Orlando to attend the return of this excellent fighter. Also, the undercard will be decked out with the return fight of the fierce fighter of Añasco, Puerto Rico. 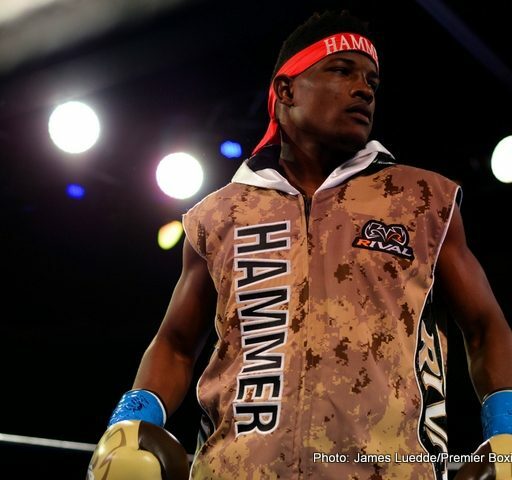 Samuel “El Macho” Figueroa in another spectacular match: Figueroa maintains that his last fight was a robbery and this time the young Puerto Rican is willing not to give the judges an opportunity to write their cards and finish this fight on the fast track. And if this were not enough, in this event will also see action two big prospects that come little by little, forging his career. 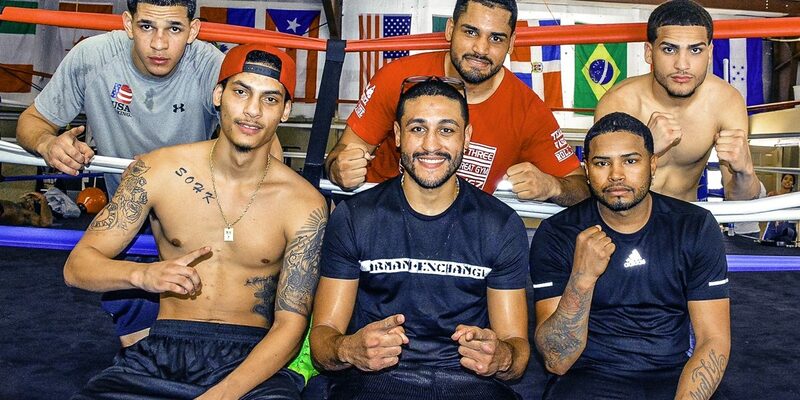 Young prospect with Puerto Rican rots, middleweight Edgar Berlanga and super lightweight Josue Vargas will rise the ring to expose their great conditions against the demanding Puerto Rican fans. “This card is full of talent. 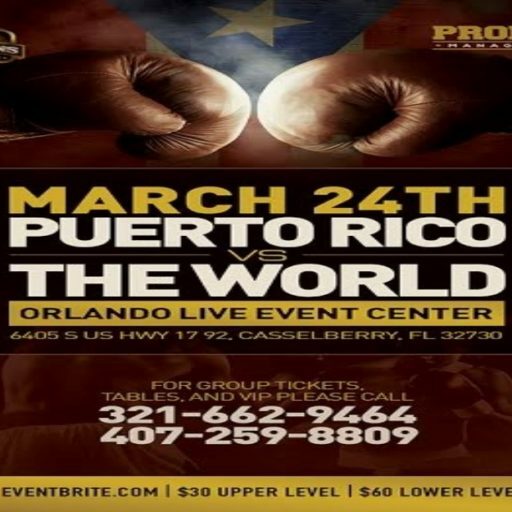 PROBOX is working alongside NELSONS Promotions, to bring our boys with Boricua rots into a quality event. We trust in our fighters and understand that “Puerto Rico vs. 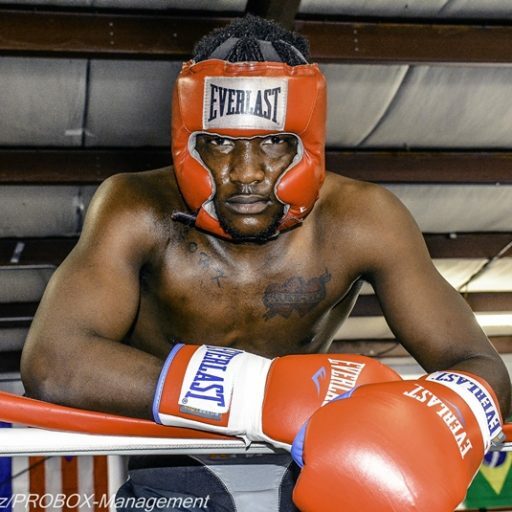 The World” will be a exiting card where fans will watch an electrifying night of boxing from the Orlando Live Event Center on March 24th” Said Garry Jonas from PROBOX Management.